The Mercedes Tarasovich SSK KAL ended May 31. I knitted two Openwork Triangle shawls, one cowl and lots of hats for a total of XXXX yards. Love learning brioche through the her Craftsy class, Brioche Knitting Made Easy. The last KAL before the July retreat is about to start. What can I accomplish now the the heat & humidity of a southern summer has settled in? Hmmm…. The June-July KAL is all inclusive of any designer who will be at the retreat. Much more variety to chose from. And if really ambitious a cotton or linen something. 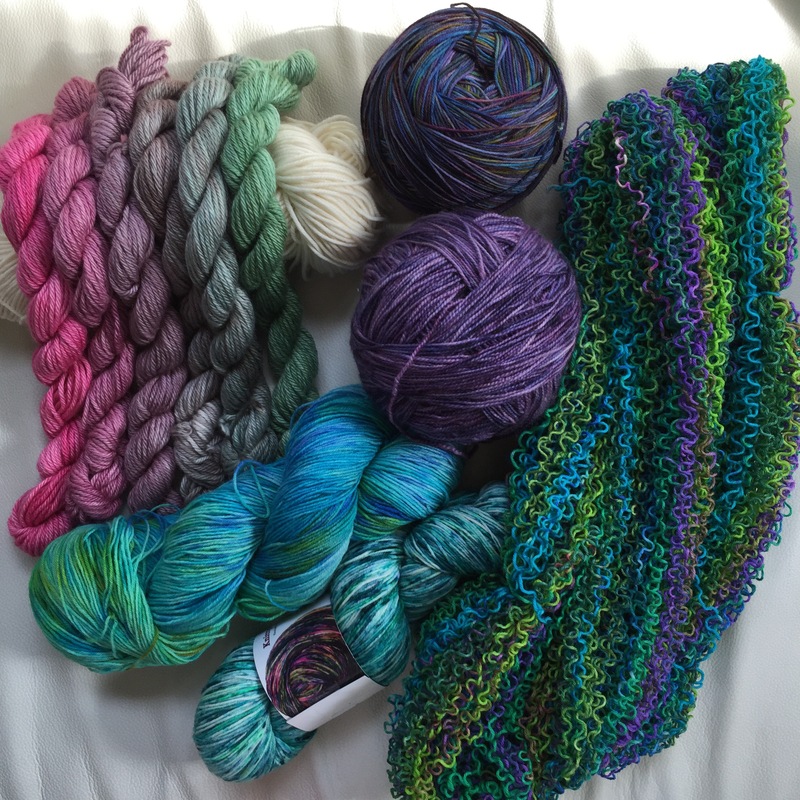 Some of the yarn I plan to use. 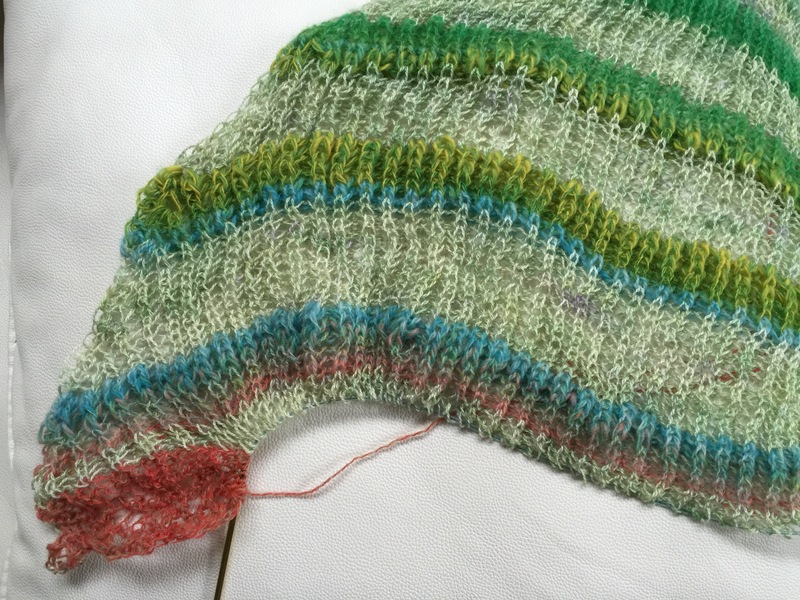 Then, of course, there’s more motivation to keep knitting…the Knitgirllls’ StashDash. My knitty friends are participating. So me too. I CAN continue the accountability part for another 5-6 weeks? Definitely want to use up stash. I do want to make some bags for SSK doorprizes. 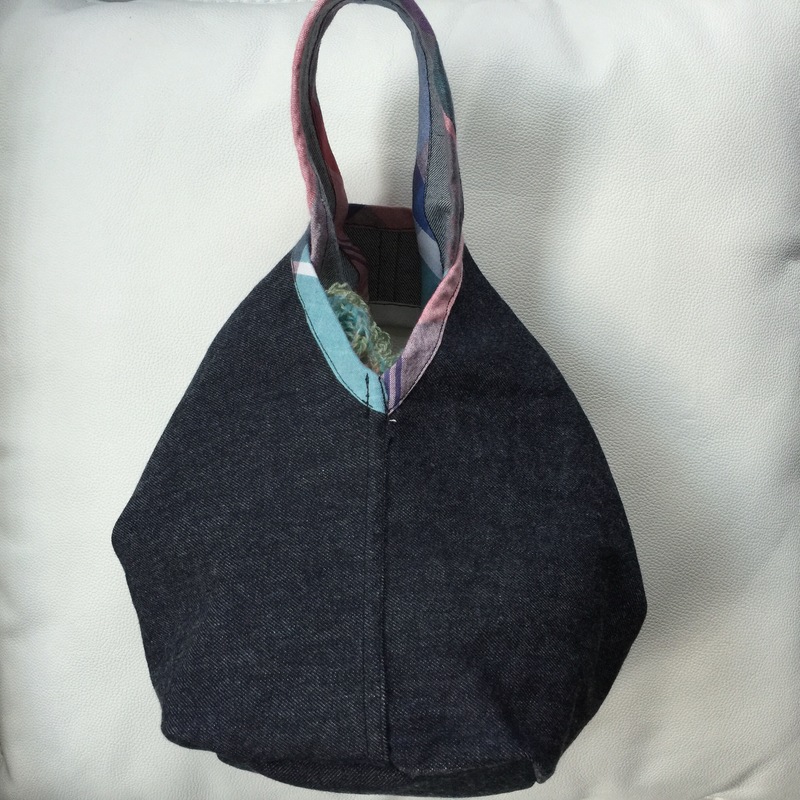 I like this small Japanese knot bag. Especially the denim. Maybe I’ll marble some fabric for a bias trim. I’m working now on a lined larger version. Definitely more complicated. 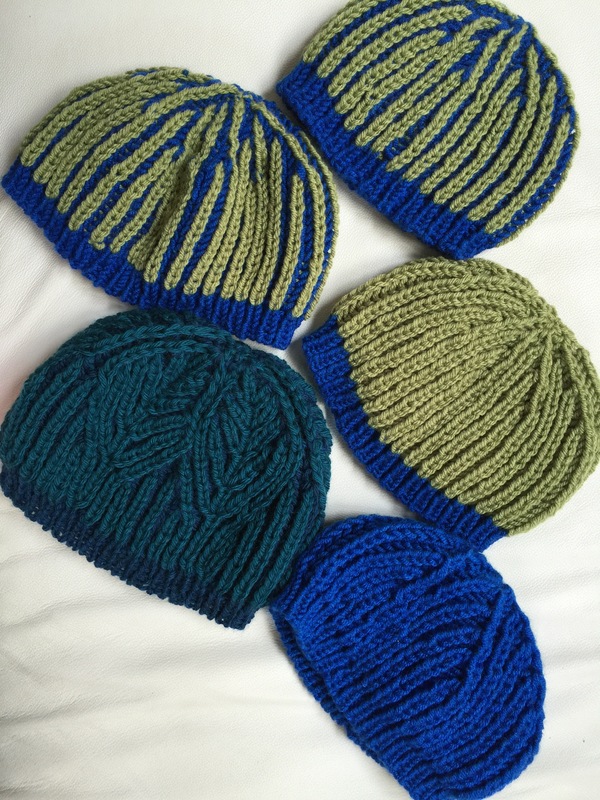 This entry was posted in Knitting and tagged kal, knitting, SSK retreat on May 30, 2016 by slantedstitches. I didn’t unfollow enough fiber folk on Instagram last week. Too many pictures were posted from Maryland Sheep and Wool festival. Even though it was clearly muddy wet, too much exposure to pretty fiber and spinning wheels and more angst for me. Not going to succumb. But it still has such a strong pull for me. Which I really don’t understand. Ok I REALLY DON’T UNDERSTAND THIS PULL. I need to use this blog post as a therapy session to resolve this crazy thinking. I AM a practical person. At the moment, I am feeling far from practical. Hmmm, Time (Money) just posted 4 Ways Your Brain Tricks You into Spending. I don’t even understand two of the ways. The ones I think affecting me are Anchoring Bias and Bandwagon Effect. Follow the above link if you want to learn more. ❌I am finally knitting with my very first handspun yarn from 2014. It’s not pretty. 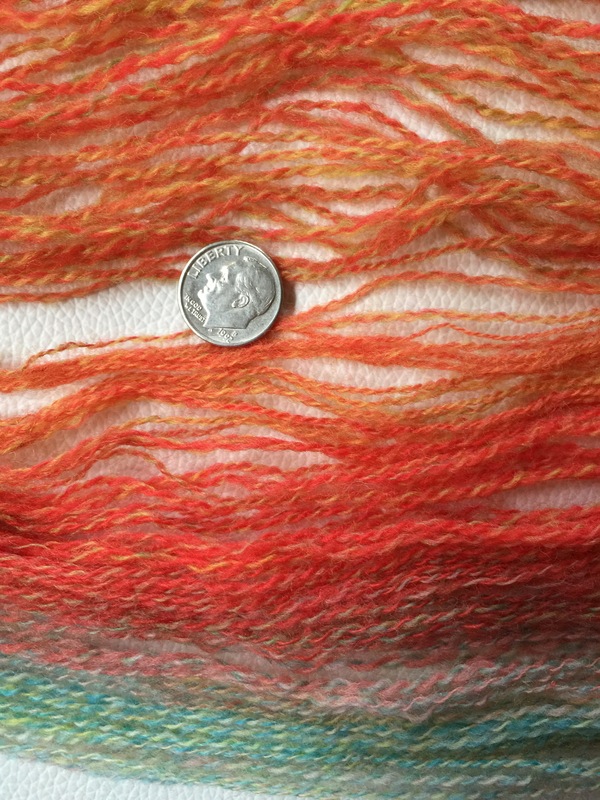 Very inconsistent lace to DK weight. But I’m happy it’s no longer an albatross around my neck. Openwork Triangle shawl nearly done. ❌I am now sad that I gave away my first wheel spun yarn at the local guild’s retreat as a door prize. I just needed a year apart to realize how pretty it is. Of course, it would be sitting in my craft closet for another few years before it was no longer too precious to knit. Ok, it would have become another albatross around my neck. So what is it about spinning? 🚫: Is it about having the wheel? The other accessories like a counter, nittynotty, the lazy Kate, the swift? ❌: Is it about buying fiber? ✅: Is it about the process? ✅: Is it about the yarns produced? 🚫: Is it about knitting with handspun yarns? 🚫⁉️: Is this a social activity? 🚫: Will this make shoulder & arm injuries worse? Ok, too much red and not enough green checks. This could easily become one of the many hobbies I am consumed by and then abandon in a few years. 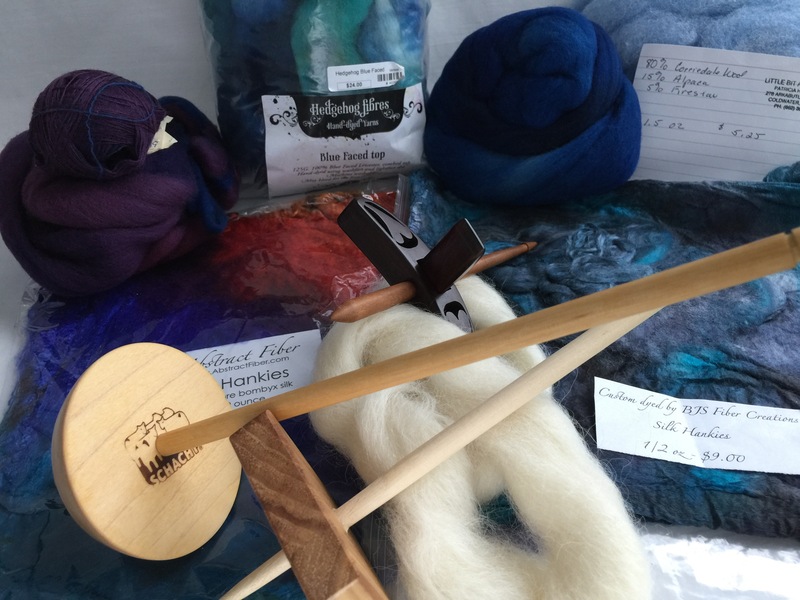 Sigh…Maybe once a year, I will scratch the spinning itch with a spindle project or rent a wheel. But not now, first I have more SSK KALs before July. But I am dreaming of spindle spinning some purples & blues. Several fiber folk are doing a simple 15minutes a day (#spin15aday). Can I do this? Will find out after SSK. Oh, a friend asked me to knit a girl’s cardigan. Sounds like fun. And probably this first project to knit after July. Ok, I’m feeling a little better. Plenty to do without adding yet another fiber craft. I think I just needed to have a plan for my knitting. Thanks for letting me indulge in some talk therapy. 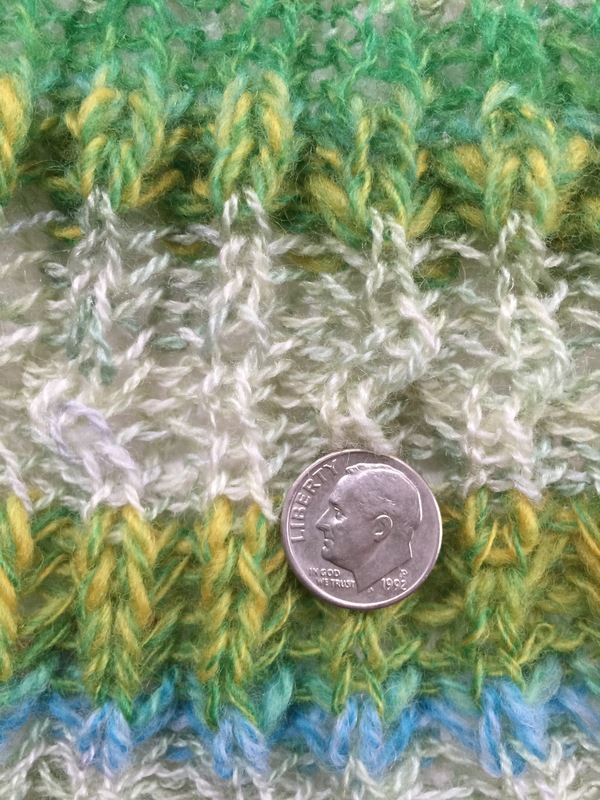 This entry was posted in Knitting, Spindle, Spinning - No Needles, Zigzagging and tagged handspun, knitting, Spindle, Spinning, spinning wheel on May 16, 2016 by slantedstitches. The Knitgirllls have an annual Stashdash for fiber, with yardage goals (3k, 5k, 7k, 10k, 15k & giveaways gifts. I am not participating in this event officially. I don’t need the pressure to produce a lot of knitting (and as mentioned last don’t want to be tempted with spinning). Though I do love idea, the incentive to finish WIPs or use up stash. I might at least do that. I do have at least two shawls and a few pairs of socks I can complete. At an average 400 yards per project, that would be a measly 1600 total yards. Not even close to the easiest goal posted. So I’ll participate in spirit. I prefer to focus on my own fabric Stashdash. Thinking about officially closing my etsy shop has freed me from saving all my fabric stash for the business. Don’t worry, I never expensed the fabric so the IRS won’t care. I definitely increased my stash beyond manageable levels while running the Esty shop. And if I’m totally honest, shopping for fabric was my favorite part of the business. I just did too much of the shopping and not enough sewing. Fabric sparks joy. More fabric sparked more joy. All the potential projects….Sigh…follow through, not so much. Sewing not so much. Now, I’m looking for every possible easy project to consume all this fabric. I have given myself permission to change things out. 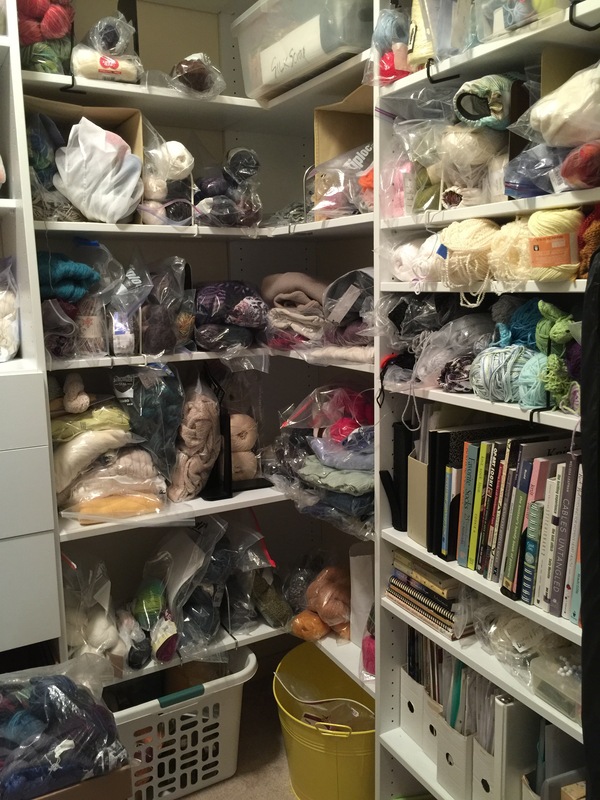 Ok, so this is the KonMari part. I’m tackling the things that don’t spark joy. And turning them into things I love. The first were the kitchen bar chairs. Posted about these a few weeks ago. 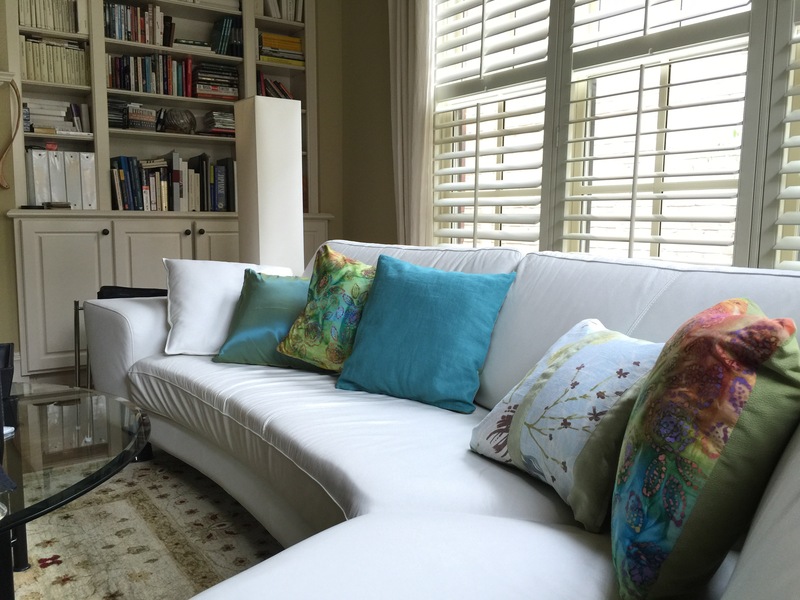 The second is the 12 year old living room throw pillows. 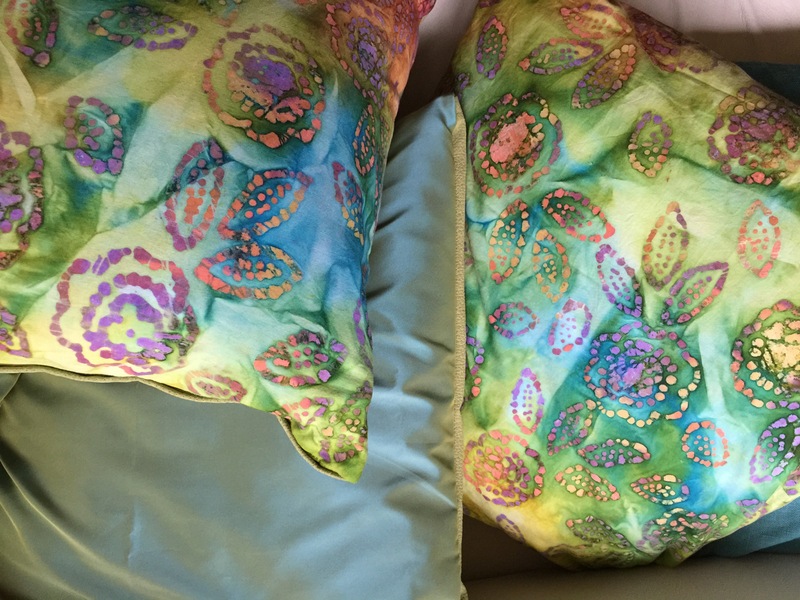 Not sure why I lived with the ugliest pillows for so long. 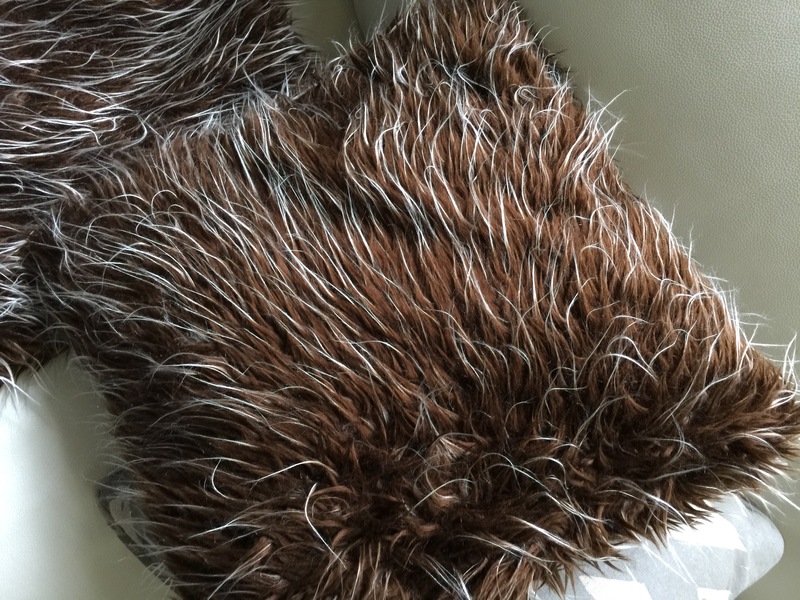 We called them, Chewbaca pillows. I love the new color direction this is taking. The house was originally painted in browns, gold,and greens. Not my favorites. Now I’m inspired to add more blues in more places. Definitely more blue ceilings than one one experiment last year. 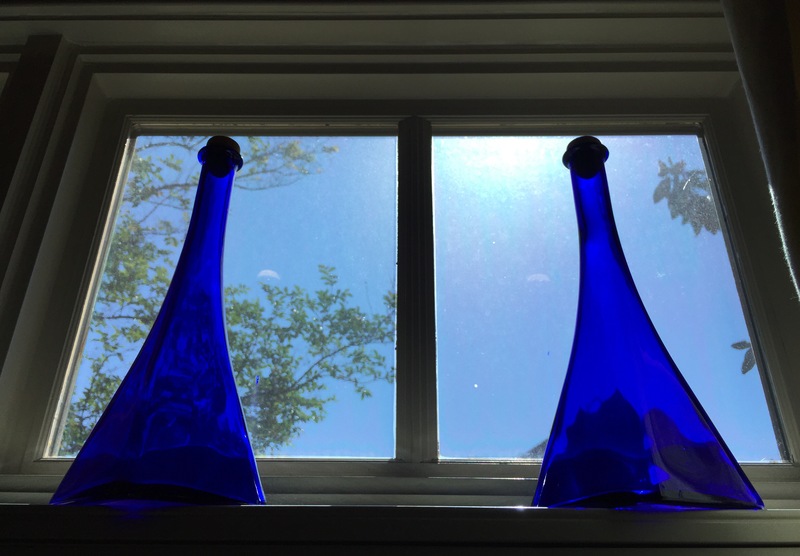 Finally found a bright spot for blue bottles I’ve had for 15 years. You’d think I planned all of this. You’d be wrong. I’m just discovering what now looks obvious. Next projects: blue borders for the living room drapes and re-upholster the guest room headboard. Maybe painting the living room if my knee -and ankle is better soon. 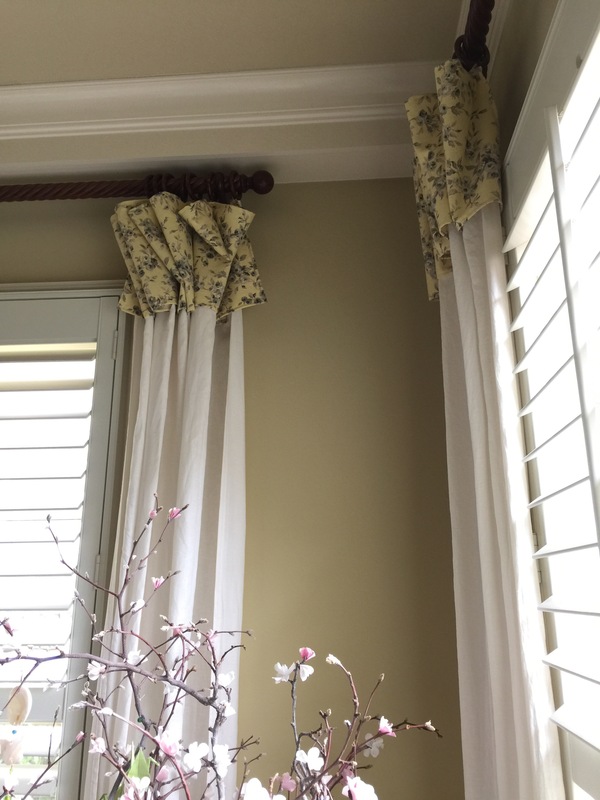 This entry was posted in KonMari Method, Sewing and tagged dashstash, fabric, pillows, sewing on May 9, 2016 by slantedstitches. I MUST have an ADD problem. I have a huge sewing & knitting to do list. I have an neglected etsy business I’m convienently ignoring. I just started marbling fabric, paper & scarves for fun. I was obsessed with pattern making on fabric (shibori and block printing) on Pinterest & Instagram. Fortunately, that obsession has played out. In the process of unfollowing those feeds. But STILL, I want to get a spinning wheel and make yarn. Not because I need yarn. Just because it looks like fun. M U S T not follow through…. Not add yet another rabbit hole. 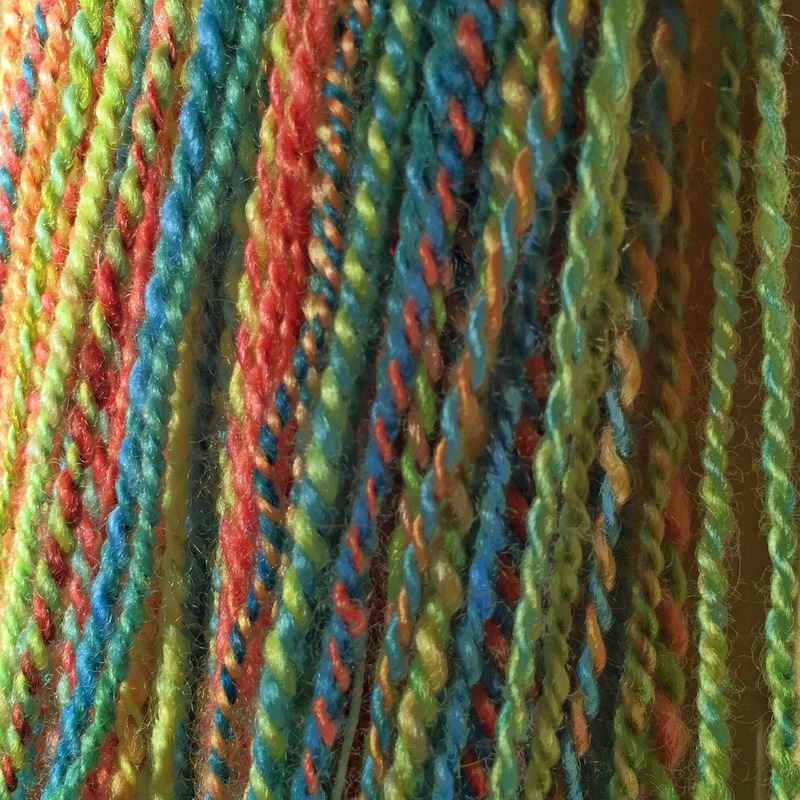 I’ll try unfollowing spinners in my Instagram feed and podcasters, except for The Knitgirllls. 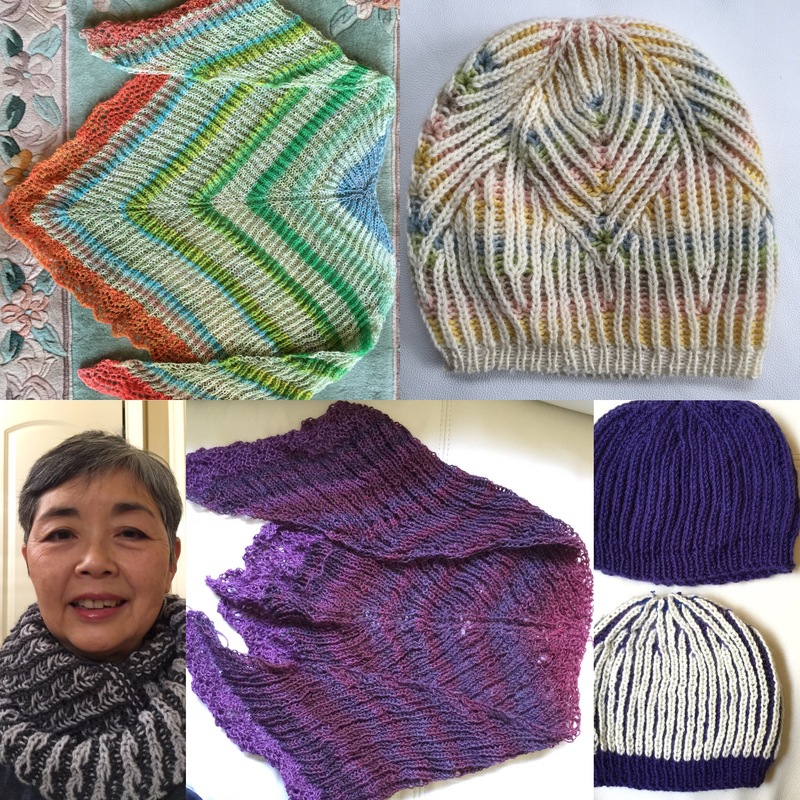 This entry was posted in Knitting, Spinning - No Needles, Zigzagging and tagged knitting, Spinning, spinning wheel, yarn on May 2, 2016 by slantedstitches.